Continued from Part III: Advance Directives: Forms and Where To Find Them. I felt a twinge of resentment this morning because it doesn’t seem like completing an advance directive should be this hard. But then it hit me that one of the reasons it’s so complicated is because we’re living (and dying) in the medical wild, wild west…a vast unexplored, exciting territory with new discoveries happening every day. 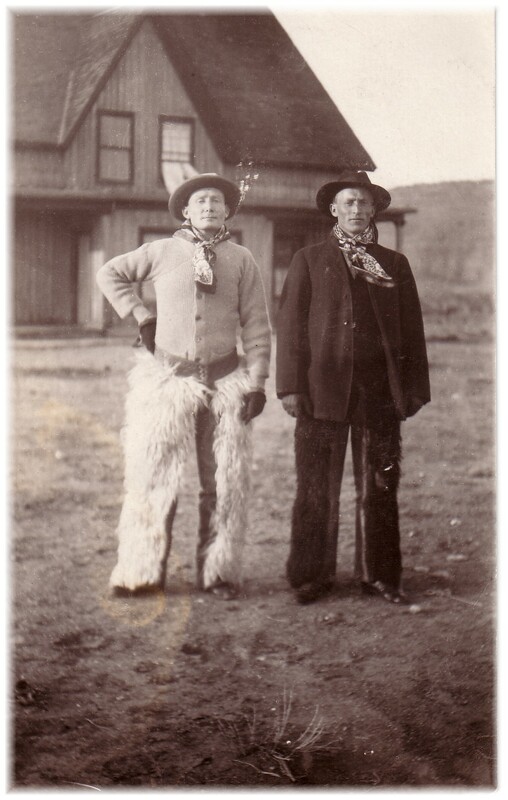 A couple of pioneering ancestors of mine. So of course the learning curve is steep. Pioneering always involves hard work. But it also means there aren’t any right or wrong choices yet. Just lots and lots of new ones. Enough. Now that I’ve identified the hurdles, onward and upward over them. 1) Make hard copies and hand them out. 3) Some blend of the above two. 1) Privacy issues. This information is intimate stuff. Who/how many do we really want to share it with? 2) Security issues. Who can we trust with this information? 3) Confusion issues. We need to update this information once a year or when it changes. How do we make sure every copy out there is also updated? 4) Accessibility issues. How can we best ensure that the people who need this information will have it if necessary? Privacy and Security: Everyone’s going to have their own preferences for privacy concerning their advance directive. Personally, while I want my specific personal information protected, I’d just as soon as many people as possible know what my wishes are. I feel like the more people who know, the less likely it is that mistaken choices could be made. In fact, I’m planning to include pertinent information from my advance directive in February’s posts, partly as a possible example of one way to do it, partly to stimulate some conversation, but mostly just to get the word out. I feel pretty strongly that this is an area where secrecy is more likely to harm than help me. Now, comparing hard copies to online registries in terms of privacy and security: hard copies let us control how many copies and who gets them. We can pick only the people we trust to take care of them, so there will be less likelihood of “leaks.” These will also be the people we already have relationships with, and therefore people whom it will be easiest (and most necessary) to have ongoing conversations with. Confusion: On the one hand, it’s harder to update hard copies, much less all the hard copies out there, as often as they might need it. However, putting an advance directive online with a state registry now could also lead to confusion. (Chaos link again.) I’m rethinking my original intention to use our state registry for this reason. At least for now. So, there are pros and cons to both hard copies and online registries, which is why I think we personally will use a blend of the two. We’ll get a limited number of hard copies into the hands of kids and parents, and then register our documents with one of the private online registries where our other loved ones will be able to view them with the use of a private link. State online registries: Only a few states have these so far. Here’s the most recent list I could find from FierceHealthIT. Several states have created online advance directive registries with the intent of connecting them to statewide health information exchanges (HIEs), according to an article in American Medical News. Recently, Virginia became the latest state to take this action, joining Idaho, Montana, and West Virginia. Washington state also planned to start an advance directive registry, but had to drop that plan because of budget cuts. U.S. Living Will Registry: Provides access to documents 24 hours per day, anywhere in the world. Also provides a wallet ID card, labels to attach to drivers license and insurance cards, and yearly reminders to update your directive if necessary. Also provides document access to medical personnel (of course) as well as online personal access to registrants for viewing and updating documents. Any advance directive form is compatible with this registry. There are fees. America Living Will Registry: Provides access to documents 24 hours per day, anywhere in the world. Provides an ID card with a toll-free emergency number and web address. Emergency medical personnel may obtain copies of your directives either on-line or via fax. Any advance directive form is compatible with this registry, including Canadian. There are fees. MyDirectives.com: Provides both medical and personal access to documents 24 hours per day, anywhere in the world. They don’t provide an ID card to protect registrants’ security. As I mentioned in an earlier post, MyDirectives.com is a new approach that provides a completely web-based form and registration process which promises to be a lot more user-friendly than anything so far. They provide their own advance directive to fill out with helpful prompts and conversation starters. Other advance directive forms cannot be used with this registry. Their service is free. Well, today’s the last day of January so I guess this concludes the research leg of the journey. Time to roll up our sleeves and take the first real step. Next post: Part V: Advance Directives: Best To Wish Carefully With A Genie.